I've built a guitar amp with STA540, I'm trying to make it work now and I need some hints on how to continue debugging. I'm getting no sound on the speaker, not even clicking, or anything. 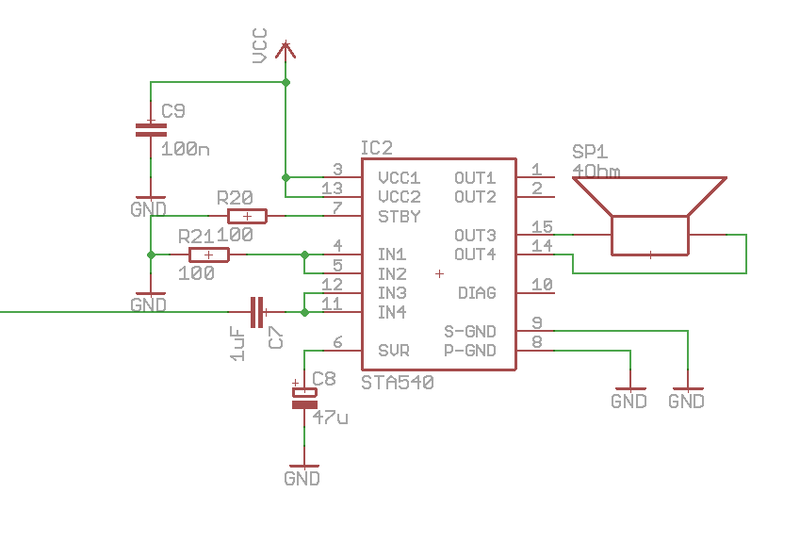 I've tried putting a 1kHz sine wave to the input and connecting headphones to various parts of the circuit and it looks that the signal gets to the STA540 input, but there is nothing on the speaker output. The schematic looks like this: input coming from the left, Vcc is 12V This is mostly copied from the datasheet example, only stby and in1 and in2 are grounded instead of being left as inputs (the 100 ohm resistors are left over from some experimenting). Personally, when starting to use an unfamiliar chip, I would often begin by completely copying a simple datasheet example circuit before any experiments or customisations :-) That allows us to confirm that our specific chip is working OK, and gives us a known-good "starting point" we can go back to, if things stop working during our experiments. there is nothing on the speaker output. Some precautions need to be taken when designing the driving circuit for pin 7, ST-BY. For instance, the pin cannot be directly driven by a voltage source having a current capability higher than 5 mA. In practical cases a series resistance must be inserted, giving it the double purpose of limiting the current at pin 7 and to smooth down the standby on/off transitions. And, when done in combination with a capacitor, prevents output pop. A capacitor of at least 100 nF from pin 7 to S-GND, with no resistance in between, is necessary to ensure correct turn-on. See the example circuits in the datasheet for suitable RC values if you want to be able to control ST-BY externally, or use a 100nF capacitor only (no resistor) between pin 7 and S-Gnd as explained in the above quote from the datasheet, to at least get the chip out of standby mode. That would be my next step in troubleshooting (although there could be other problems e.g. regarding the wiring between P-Gnd and S-Gnd which we can't tell from just a schematic). I hope the current circuit hasn't damaged your chip... Good luck! Not the answer you're looking for? Browse other questions tagged amplifier audio debugging or ask your own question. Why does an diff-amp being fed by two separate op-amps with low input resistances distort the signal on the inverting input?